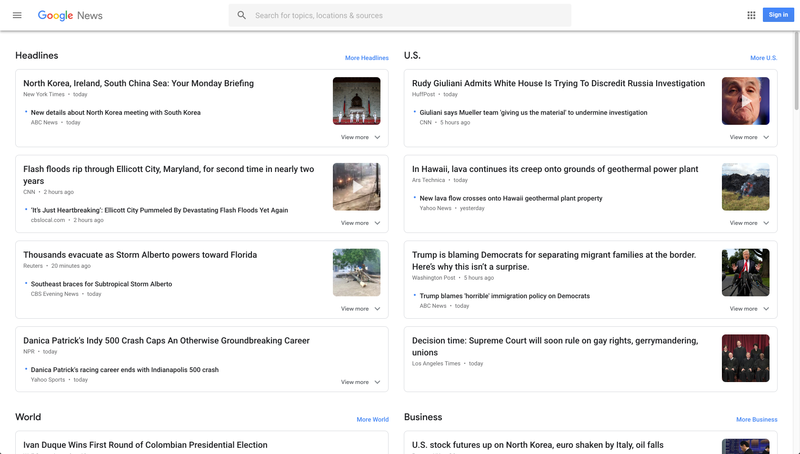 2019-04-15 (2.0.4): Updating rows to accommodate six articles under "Headlines." 2018-04-01 (1.0.7): Matched the CSS classes Google changed to fix initial left-side menu hiding. 2018-02-11 (1.0.6): Matched the CSS classes Google changed to fix initial left-side menu hiding. 2017-12-09 (1.0.5): Matched the CSS classes Google changed to fix width and initial left-side menu hiding. 2017-09-24 (1.0.4): Brought back "Top Stories" section and figured out how to auto-collapse the first article and left-side menu on-load. 2017-09-24 (1.0.3): Un-did the hiding of the fourth article card, I originally reacted to the number of articles displayed in the "Top Stories" section. Each section now displays the first four articles as Google intended. Next update (1.0.4) will bring back the "Top Stories" section because I noticed I was missing some important news articles not listed in "World" or "U.S."
2017-07-12 (1.0.2): Added two-column views to News sub-sections (World, U.S., Technology, etc.). 2017-07-08 (1.0.1, 1.0.0): Shrank thumbnail sizes, replaced "RELATED COVERAGE" heading with a border. Reduced article cards for each section back down to three. Hid "Top Stories" section. I didn't like how the first news story in "Top Stories" section was expanded by default and took up significant vertical space. I don't know enough JS to close it so I just used CSS to hide the entire "Top Stories" section. Not desirable but I actually don't miss "Top Stories" since it was mostly a repeat of World + US News topics. Got rid of text color change on card hover. Also got rid of enhanced box-shadow effect on card hover.